1. X: Holidays are coming up. Y: What do you plan? X: I’m going to Bali. I will go to some tourist resorts such as Tampak Siring, Bedugul, Kintamani, Kuta and Kute Square. I will go shopping, swimming, and see beautiful scenary. I’m going to be there for a week. Y: Oh, it sounds wonderful. I envy you. 2. X: Hello Jack. Where are you now? Y: I’m still at the office. Why? X: I need to see you. Please, wait for me there. 3. X: When will you come over for dinner? Will you come tonight? Y: Not tonight. I promise to go to a concert with my brother. X: Well, how about Friday then? Why is the woman not able to go to dinner? 4. X: Look at me! Does this long red dress fit me, John? Y: I don’t think so. I think the green long dress is better than the red one. X: How about this short black one, then? Y: Yes, that fits you. You look cool choosing that one. Which dress fits the woman? 5. X: Do you have any problem with our service in this resort, Mom? What is the most appropriate response for the woman to give? A. Sorry, I can not do it. C. No, I’m satisfied with it. D. Yes, please finish it. 6. X: The air pollution caused by cars and factories create green house effect and destroy the ocean layer. What is the man most likely to reply? A. It is good for our health. B. Everything is fine, thank you. C. Yes, this is very bad situation. D. It would be delighted. 7. X: What’s the matter, Dara? You look sad today. Y: My father is very ill and has been hospitalized since yesterday. What is the most appropriate response for the man to say next? A. I hope he will get better soon. B. I think you should take a rest. C. I am glad to hear that. D. I suggest you cheer up forever. 8. X: Oh, I’m so exhausted. X: I ploughed the field by myself. 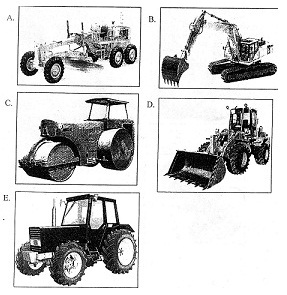 Y: Why didn’t you use the tractor? Which picture shows the woman suggestion? 9. X: I think I’ll take a kilo of pear. Y: Sure. Do you want any apples, mangoes, or bananas? X: I need a pineapple for my diet. 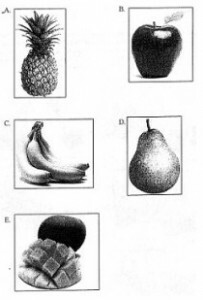 Which picture shows the fruit the woman need? 10. I love adventure and riding fast. This vehicle is a great form of transport and can also be used in racing event. It is best suited to riding on dusty road and rock to race. 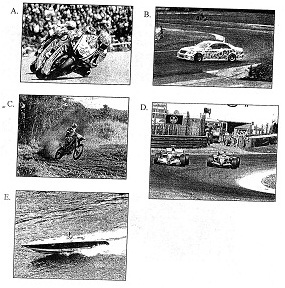 Which picture show the vehicle describe in the monologue. 11. Located on the the southeastern side of Bali, Sanur beach is easily reachable from Den Pasar after this only a 5-10 minutes drive away. Sanur is a beautiful place to watch the sun rise, under the water and the sea base, enrich at the shore. Its white sandy beach is perfect for swimming or relaxing. 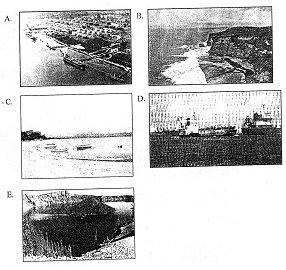 Which picture shows the location in the monologue? Question 12-13 refer to the following monologue. Daniel Jacob Radcliffe is a British actor. He is best known for playing Harry Potter in the picture film series based on the popular book series. Radcliffe was born on 23 July, 1989 in Queen Charlotte’s Hospital, West London, England. He is the only child of Alan Radcliffe, a literary agent and and Marcia Jeannine Gresham, a casting agent who was involved in several films. 12. What is the main topic of the monologue? 13. What is Daniel best known for? Question 14-15 refer to the following monologue. Ladies and Gentlemen, in case of emergency, take the life jacket, which is located under your seat. Pull the life jacket over your head, and then fasten the jacket tapes around your waist. Do not inflate the jacket until you have left the aircraft. The jacket will automatically inflate by pulling the cord. If it is not, you can blow into the tube to inflate it. A light is attached to the jacket for attracting attention. The life jacket should be released only in case of emergency. The use of TV set, AM and FM radios and radio cassette recorder, walkman and any mobile phones are prohibited on board as they interfere with the communications and navigational system. We wish you an enjoyable flight. 14. Where is the life jacket located? 15. What can interfere with the navigational system?